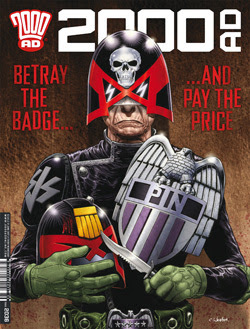 My thoughts on Prog 2036 of 2000 AD – out now! I thought this would be a longer arc and although this finishes here, it’s not the end of the story, it’s something else. It looks to be quite brutal as there is something wrong in the hands of SJS Pin! I thought last week was a dark ending, but this weeks was even more so. Dredd won’t know how close he came to being just another plant pot! There is going to be rumblings about this for a while! This was a fast paced issue with running, gun battles and a problem at the end. There’s not too much to learn from this issue, but it’s good to get the ladies all back together and now things don’t look too good. I hope we find out soon! We find out more about Chapman’s plan and what he’s been up to in this issue. Needless to say that Defoe is not impressed. The art continues to be excellent here, with some gory scenes and a nice final panel!. Defoe looks to be in trouble as his guns aren’t good enough for the reeks and there seem to be more coming! It seems we’re back to the old job in Grey Area. It is interesting the butting of heads between the two team leaders though. I like the process and the additions to the team are working out really well. Next issue looks to have more action, with someone/thing going postal though! The hunt is on! With more adding to the hunt for this southerner traitor general, it looks like it’s all going to come to a head above Nu-Earth. There is some interesting revenge/information gathering and a team-up between to others.